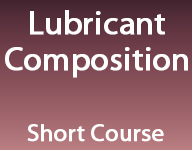 This course is presented in five parts: Additives, Base Oils, and 3 modules on Grease. The module on Additives covers the functions of lubricants, types of additives and the lubricant applications in which they are used, additive systems and the specific additives and how they do their job including chemistry and function in a formulation. The module on Base Oils covers base oil chemistries, properties and their uses. Includes detail on mineral oils, synthetics, base oil classification, vegetable oils and emerging technologies. The first module on Grease covers the definition of greases, history and terminology, composition and chemistry and manufacturing techniques. The second module on Grease covers grease testing including consistency, stability, corrosion protection, EP and anti-wear protection, water tolerance, oxidation resistance and several other lab tests run for specialty applications. The third module on Grease covers grease applications and advantages/disadvantages of greases in those applications. This will include discussions on considerations by application type, how to select the right grease and how to troubleshoot grease problems, and compare where grease works best and where oil works best.